For the person who wants everything, the truly spacious Hydropool Self-Cleaning 970 is a 9 person hot tub that consists of a never-float lounger, along with a Muskoka-style chair and eight additional seats. 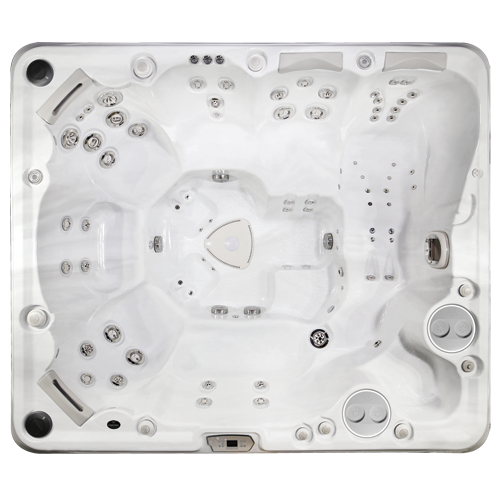 This large hot tub has a unique volcano-style jetting system for the feet, plus easy-access, non-slip steps built right into the interior. The advanced technology of the Hydropool Self-Cleaning system makes this the easiest hot tub in the world to maintain by removing debris from both the surface and bottom, cleaning 100% of the water every 15 minutes. The Hydropool Self-Cleaning 970 boasts 70 jets as part of our Titanium Series, offering our stainless steel, fully adjustable, high-volume hydrotherapy jetting system. Our exclusively designed zoned jetting delivers a balanced, soothing massage and a rejuvenating spa experience.